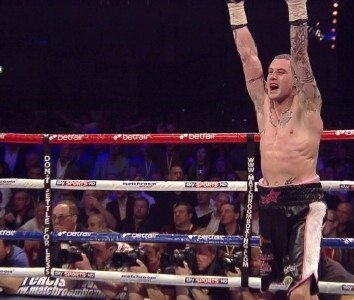 When Ricky Burns climbs into the ring at the SECC in Glasgow on March 1 to defend his WBO lightweight title against unbeaten American challenger, Terence Crawford, he will be entitled to feel like a man returning to the scene of a crime he never committed but was convicted, tried, and found guilty of nonetheless. The trials and tribulations that Burns endured in 2013 were more than staggering they were inhuman, even for a fighter as experienced as he is. Not once but twice he was forced to reach down into that place which resides in every human being but in normal people is buried so deep after years spent avoiding risk, danger, and hardship that they don’t even know it exists; and even if they did they would have no need of it anyway. It’s called the human spirit and from it is derived the will to endure unspeakable agony in the process of prevailing against seemingly insurmountable odds. Make no mistake, in the ring against both Jose Gonzalez and Ray Beltran, Ricky Burns looked into an abyss. What he saw looking back at him is something he alone knows. What we do know is that it was enough to provide him with the inner strength to keep going beyond the point where human logic and instinct ends and the will to survive is predicated on the courage to risk everything in the attempt. Burns risked everything in both fights, refusing to capitulate, which against Gonzalez saw him survive an onslaught in the 7th round which the Puerto Rican and his team must still watch in awe at the Scot’s defiance of the laws of nature. Just as it broke his heart on the night, it’s a fair bet that Jose Gonzalez suffers a broken heart every time he thinks about what might have been – in fact make that ‘should have been’ – but wasn’t. Yet even though the world champion’s victory – the dramatic nature of it – was rightly met by huge admiration for the heart and guts he showed, we knew that on the night we had witnessed a below par Ricky Burns do what all great champions do and find a way to win when the chips are down. Against Raymundo Beltran a few months later, Burns only held onto his title by dint of the kind of judging that brings boxing into disrepute. Yet given that he’d fought ten rounds with a broken jaw, the miracle is that he managed to last the distance at all. Ray Beltran and his team were justified in feeling they were victims of an injustice, and going by the silence that met the result, most of the crowd agreed. But no blame can be attributed to Ricky Burns. What it has done where the world champion is concerned is cast doubt in the minds of many over his ability to hold onto his title against his next opponent, Terence Crawford, commonly regarded as the best he will face in his career to date. These doubts are all the more reason to back Burns to prevail yet again, reminding us of the way he was written off against Roman ‘Rocky’ Martinez when he challenged for the super featherweight title in 2010, proving the doubters wrong with an epic performance that involved him picking himself off the canvas in the first round to go an comprehensively outbox the defending world champion and take his title by unanimous decision. Thereafter the Scot successfully defended his super featherweight title three times before moving up in weight to battle it out for the WBO interim lightweight title against Michael Katsidis. This was another fight that Burns was expected to lose, with many convinced he’d be steamrollered into submission by a fighter known to possess real juice in his hands. The naysayers were forced to eat their words again, however, as Burns proceeded to absorb everything the Australian warrior had while countering with the cleaner shots throughout to outbox his opponent and register another deserved unanimous decision. Anyone following the Scottish world champion’s career knows that the bigger the challenge and the more he’s written off the better he performs. Going in as the underdog in the minds of most against Crawford, combined with the added mental strength he undoubtedly would have gained from surviving a torrid 2013, means that motivation won’t be an issue in this training camp. That said, Burns’s long time trainer, Billy Nelson, is not merely relying on his fighter’s proven qualities of will and grit to see him through against the unbeaten American on March 1. While speaking to him briefly at the presser to formally announce the fight back in January, Nelson took pains to point out that he’d introduced a strength and conditioning coach into the camp for the first time, which he said was already paying dividends in increasing the power of Ricky’s shots, and that he’d arranged for the champion to have the best sparring he’s ever had. Incidentally, the word coming out is that Burns has looked sensational in sparring these past few weeks, and against sterling opposition, as he prepares to embark on his tenth world title fight. What is certain is that Nelson will be leaving nothing to chance as he prepares Burns to face an opponent most expect to defeat him. At the presser the proprietor of the Fighting Scots Gym near Glasgow predicted it would be the hardest fight of both their careers. There is every reason to agree. Ricky Burns has already proved he’s willing to walk through hell in the ring in order to prevail. His intensity, volume, work rate, and aggression – married to an undoubted ability to box that was absent in his last two fights – ensures that any fighter who expects to take his title will need to be willing to go to a place most never have to. Terence Crawford should take note.